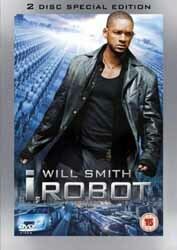 Darren Rea: How did you originally get involved with I, Robot? 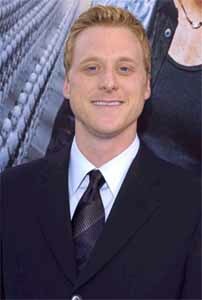 Alan Tudyk: I read the script and liked it. 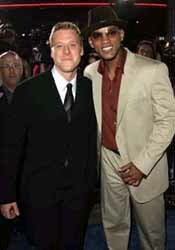 I think that they had been auditioning for a while, but I was still working on a TV show at the time. Then that got cancelled and I was available. DR: Had you read the short stories? AT: Yes, I read the first book in High School. Once I got the part then I read a lot of other Assimov. I really enjoyed them, he's such a great writer. He puts out the first three laws and then these robots are acting in a way that appears to be breaking the three laws. And then he finds a way to show you that logically they weren't breaking the three laws, but they are still acting in ways that made it seem as though they were. DR: Tell us about the green spandex. Did you ever secretly smuggle it off set to wear at home? AT: [Laughs] No..... although, I do still have one at home. It's for the specific reason that if they ever decide to do an I, Robot 2 I'm going to put it on anytime were talking about the negotiations so that I can remember fully what I'm getting myself into again [laugh]. Yeah, it just sort of hangs in my closet. DR: What was that like? Having your tackle on show must have been a bit intimidating? AT: [Laughs] Exactly. It helped keep me in shape. The only people you tend to see wearing spandex are gymnasts or super heroes. For it to look good, your body has to be in gymnast super hero shape. You've got Bridget Moynahan [who plays Susan Calvin] on set so you really want to look your best, but it's impossible. DR: How worrying was the whole green screen process? At the end of the day your acting can be great, but if the effects are sloppy the whole movie falls apart. Was that a concern while you were filming - that it might look terrible? AT: Yes. In any project you do, artistically there is an element of trust. You have to trust the people in charge. When the director says: "Trust me. This is how you should play the scene. It will look good this way," you have to give over a lot of trust that they know what they are doing. But with I, Robot you had to give over even more. They were saying: "Okay, we are going to erase your face, but trust me we're going to make the robot do everything you did - trust me." 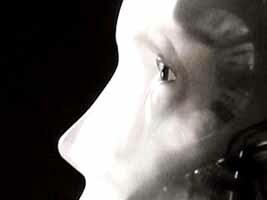 At the end of the day I don't think they really had to, but I did trust Alex Proyas [I, Robot's director]. He's a great guy. I was invite over to the digital house as we were filming so I got to see the progress of the effects. There would be a big screen with half of my face on one side and half of the robot's on the other side and Alex would go through and say things like: "Alan's mouth is curling more at the edge than the robot's is." Or an eyebrow would appear slightly differently to signify the human emotion of hope and he would say: "There's hope in Alan's face, but there isn't hope in the robot's face. I need the hope in the robot's face. Achieve that would you?" He really stuck to it and followed what I did. It was a gamble, but it paid off. I trusted the right man. DR: Obviously, seeing the finished movie must have been a huge relief. AT: Yeah, yeah most definitely. DR: You had to go to robot school to learn to walk and move, but how did you come up with the voice for Sonny? AT: I came up with all the movement too. On the DVD it suggests that Paul McCurio was the only one working on the movements for the robots, but that's not true. I worked with a man named Steven Hill, who was a theatre director. Between us we discussed numerous movement disciplines, watched tapes of ballet, Japanese No Theatre and mime, just following different ways you can tell emotion through movement. We ended up using a couple of things, but mainly the Alexander technique. This uses the skeleton as a frame, as we all do, but in the way that it's supposed to be. It's not just posture, but the balance of your skeleton. Using the most efficient movement possible - which a robot would do - to move from point A to point B. The voice? I had gone to theatre school and had learned a lot about the voice and speaking and how to keep the words by themselves and not blending them all together. In more emotional times they do blend together. It was just about logic. Every word has it's own place and it was about diction. DR: There's a slight bit of a British accent in there too - a bit like 2001's Hal or Star War's C3PO. 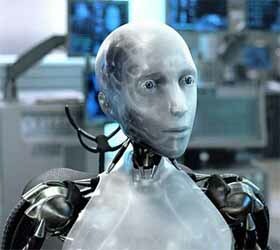 Why is it that the British are always robots or bad guys in movies? AT: [Laughs] Actually, I learnt in theatre school, they teach this Mid-Atlantic speech - which to many people sounds British, but they swear that it isn't [Laughs]. It isn't, but it does have elements of it. It's definitely not the common way that people speak in America, for sure. Or how I speak myself. But I don't know why Englishmen get all the bad roles. So do the Australians. I suppose that it's this element of 'other' that allows them to be mysterious in a way that an American can't achieve - or something. I don't know. I hope the trend changes, because I want to be a bad guy at some point. DR: This movie's not the usual no brainer blockbuster that the Hollywood movie industry usually churns out. 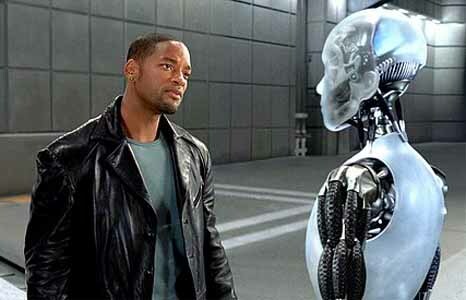 Do you think that the industry will follow I, Robot's example and make more intelligent movies for a wider audience in the future? AT: God I hope so. [Laughs] And I think audiences hope so. Audiences are pretty smart and they are starting to expect more. Now that there's a DVD market they're going to want something that is watchable time and time again. And they don't want a movie where they can guess the ending two minutes after it starts. DR: Do you embrace technology? Do you have all the latest gadgets? AT: I do have all the latest gadgets. I can't work any of them so it's more from a consumer need and: "Look what I bought... one day I'll plug it in." I've got friends who are gadget heads and they come round and show me how things work. I've got two computers and neither of them work right now. I've no idea how to work either. 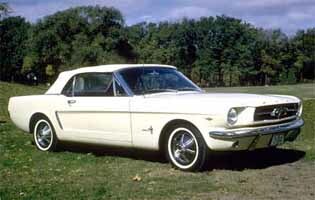 DR: There's an Internet rumour that you had an old 1964 Mustang called Old Sock. Is that true? AT: It was a 1965 Mustang, but yeah I did. DR: Old Sock? What's that all about? AT: [Laughs] It's so funny that that story is out. I don't know who told that but it had to have come from about five people from my childhood that I grew up with that knew that. It was just a name - it was something in my neighbourhood. I named lots of things Old Sock [laughs]. A bike was Old Sock at one point and as I got older my first car was called Old Sock, because it made sense at the time. I no longer have the car. It was my father's car, which he bought in 1965. It was his first car and he gave it me to drive for my first car and I wrecked the hell out of it [laughs] more than once. Oh man did I owe my father a Mustang - a new Old Sock. I really do. DR: If robot's were commercially available would you buy one? And what chore would you have it perform? AT: Sure. I would love a robot. I could send it to work doing anything. I could get it to build an extra floor to my house. Build it would you? Or it could teach me to use all the gadget that I can't work [laughs]. DR: Where you apprehensive about working with Will Smith? AT: Yeah, I didn't know what to expect because he's sort of like a superstar. The first time I met him he brought a fart machine to the dinner. It was one of those with a remote control button and he gave it to his producing partner, who kept it in his pocket. Will would set it off and then blame his partner for farting. But it was apparent that it was a machine immediately because Will couldn't stop laughing. He couldn't even do the joke because he was too amused by his own joke. I knew then that we'd have a good time making this movie and we did. He's a fun guy. He's always looking for the joke and he likes to get you in on it. He doesn't exclude anyone. He's not just the one being funny while everyone else sits around laughing - he gets everybody involved in it. He was essential in making the whole process fun - especially at the four in the morning stage. Some of the days, at the end of the week, we were shooting until four in the morning. As the day went on I got tired, but as the later the day got for Will the more hyper he seemed to become. So by four in the morning he was always singing a really bad song. Some cheese, cheese song, like Roberta Flack and he'd sing it at the top of his lungs, generally off key. DR: The DVD have an incredible amount of extras. Do you think that these extras have taken some of the magic away from the movies and are you keen to get involved with them? AT: It's nice. Films have changed though. It used to be that maybe they'd have one day were they'd set up a bit of behind the scenes filming. On the movies I've been filming lately they have these secondary film crews that hang around the set and capture so much. It's great when the DVD comes out and you can revisit it - it's almost like watching a home movie - but I have to admit that that camera can be annoying [laughs]. You're discussing things, and trying to get things right and there's a camera in your face. There's a time to make the movie and a time to make the extras for the DVD and it would nice to just have the movie time occasionally. DR: In the movie Sonny has to keep a secret. Have you got a secret you can tell us? One that you've never told anyone before? AT: Erm... [Laughs] Erm... One of the ways that I wrecked Old Sock was that I played tag with my friends in our cars. If you get rammed by a car then you're "it" - Just with your friends, not other people. You'd ram the car from behind and then they would have to chase you and try to ram you. The job was to loose your friends and if you managed to do this we had a designated meeting point afterwards and then you got to have bragging rights: "Ha! Ha! I got away from you!" That was sort of Dukes of Hazzard thing we had in Texas when I was a young man. I hope my father doesn't read that... because that's real intentional. I wasn't thinking of destroying the car, I was just having a darn good time in the Texas way [laughs] in a "Yee-ha!" kinda way. DR: You've had a varied career, you've been the pilot of a spaceship, a pirate, a stripper and a robot. It's like your working your way through the fancy dress shop of parts. Are you pleased that you haven't been typecast as anyone role? AT: Yeah. It's a very colourful box of crayons. I've just played this Mexican drug dealer in an independent movie. It was written for a Mexican, but they made him an expatriate living in Mexico whose a gay drug dealer. A lot of times people will come up to me and say: "Hey, you're that guy from that movie," whichever one they recognise me from. We'll talk for a bit and they'll say: "What else have you been in? Why don't you work any more? Did you quit?" And I'll say: "I was in this or that movie too." And they'll say: "Who were you in that movie?... Oh really you were that guy - with the accent and the hair?" DR: Have you finished your work on Serenity now? AT: Yes, we finished a few months ago. 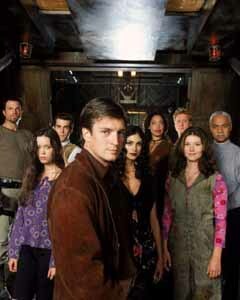 The movie picks the story up around two months after the events that were unravelled in Firefly. Everybody's there. It deals with how Simon and River were being pursued by the Alliance. That was always a problem for us and it continues to be a problem in the movie. The characters of the Reavers, which were sort of talked about in the series but you never got to really see in the TV series, make an appearance in the movie. DR: Were you shocked when Firefly was cancelled. And if Serenity is a hit do you think it will open the door for another series, or more movies? AT: It would be more movies. 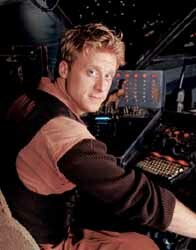 I don't think that Joss [Whedon - the creator of Firefly] would take it back to a series. It wasn't a shock that we were cancelled. It was unfortunate and very sad, but we never got the sense that we were understood in America. When it was showed in the States we had shot the two hour pilot which set up the world and the network decided that they didn't want to show the pilot first and ended up screening it last. That made no sense. The pilot welcomes you to the world and sets up the characters and the world that they inhabit. Instead the first episode to be aired was The Train Job which kind of gives you a backgound to the show, but not as much as the pilot. That's why we weren't surprised that the show was cancelled. We felt that those making the decisions either didn't like the show, or didn't understand it. We always knew we were fighting to stay alive and it was depressing. What was a surprise though was when we were cancelled Joss said: "This isn't over." At the time we were like: "That's nice, that's sweet. It's kinda sad we've been cancelled, but that's it." But he is tenacious. To get the rights from Fox to make the movie... that couldn't not have been fun. He had to do a lot of fast talking to get Fox to let go. Universal were amazing. It was great to have so much support on the project. I'm going to see the very first edit of it when I get back to the States in the first week of December. DR: If you weren't acting what would you be doing? AT: Er... Canoe rentals would be great. I could say things like: "The oars are free with the canoe rental," and: "Here have a lifejacket" I can say those things really easily. I could do this. It's a seasonal job, so I don't know how much money I would make, but that's kinda my dream other job. DR: What are you working on at the moment? AT: I've just finished, a couple of weeks ago, a movie that Steven Spielberg is producing for Dreamworks called Into the West. It's like his Band of Brother series in that it is a miniseries. There are six, two hour instalments and it's about America and starts in the 1820s. It looks at how we pushed West and had our skirmishes with the Native Americans. It also follows Native American families, so you don't just get them as savages on hills that shoot arrows at us. It also looks at how we drove Spain out of California and the Mexicans in Texas and it's all about that. The next thing I'm going to do is a voice over for Ice Age 2. I did a voice for Ice Age and they're a lot of fun. So I'll be starting work on that in January.